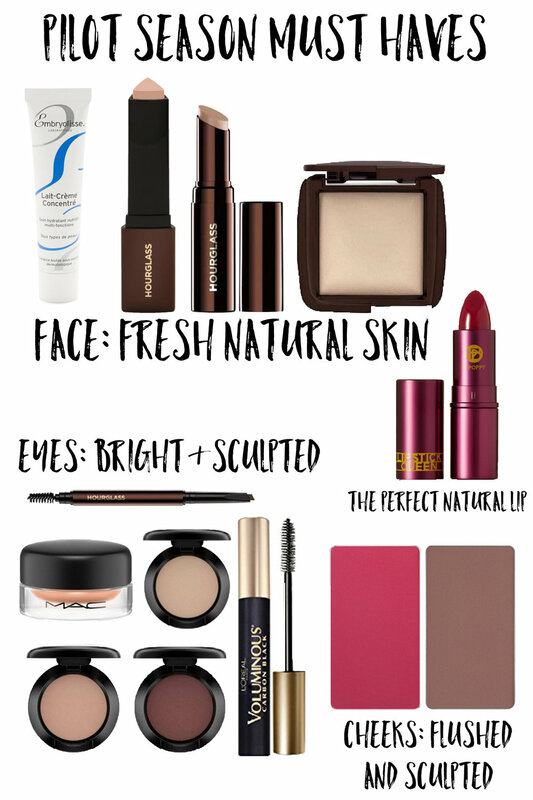 My Pilot Season must-haves for a natural, sculpted face! Ahh, the elusive pilot season. It is back. And we are in it. And it’s about to get real. Are you and your makeup bag ready? Now here’s the thing about audition makeup, it shouldn’t be that hard. I hope you know how naturally beautiful you are, how talented and worthy you are to be in that room auditioning for that role. You’ve already won. Now you get to have fun and do your thing. Looking the part is just another component. We don’t need to change anything, or go in super glamorous like we would on a night out or a photo shoot. You don’t. Because you’re focused on the story they are telling, and the makeup also tells a story. Your job when you go in to audition is to tell the story and your makeup and wardrobe are a a part of that. More often than not, you’re just enchanted by the actress and the story, her makeup is there but isn’t the focus. Let’s incorporate that into our audition looks! Like I always say, I want people to see my client, not their makeup. I apply the same rule to styling myself for auditions. It’s about connecting yourself to who you’re embodying and allowing others to connect and see you in that. So, with that being said. Style yourself in character, and typically main components are basic color correction and basic shaping of the face: fresh, natural skin, neither matte nor luminous, a soft sculpted shape to your cheeks and eyes and a soft sculpted brow with a light coat of mascara. So, here are a few of my audition favorites that keep me feeling my best while not being distracting to help you run from one audition to the next. This is my kit favorite. I use this on all my clients, and is always used on set. It is for all skin types, dries down very quickly, acts as a primer as well, and is great to put on after a few hours to rehydrate. I love putting moisturizer on sometimes after my makeup a few hours later to make it look more like skin if it’s looking dry. I do have a travel size as well I keep in my makeup bag. *Note, from what I understand the company is being bought out by another skincare line and may be difficult to come by at the moment. A great alternative is Kiehl’s Ultra Facial Moisturizer. Amazing coverage, natural skin like finish. Isn’t powdery. Looks great on camera and in person. And I love that it’s compact so can pop this in my bag for a quick touchup. You can blend this out with a brush, a beauty blender or your finger tips. Amazing natural coverage, creamy, hydrating. Very natural on camera without looking too bright. Y’all know I love this powder. Blurs out and makes your skin look photoshopped in person. Great to set everything and touch up with! Y’all know I love this paint pot. The neutral shade also helps even out the eye lid and helps your shadow hold on for dear life so you can run around all day and your eyes will be bright! This is a great velvet shadow, meaning it has great color pay off, and has a soft sheen but isn’t frosty or pearly. It’s a bone shade and helps brighten your eyes and stay neutral. Great crease color! I love the cooler shade of this so it doesn't look too orange on camera. The matte adds definition. I usually sweep this on top of my lid as well to keep it natural. Great for commercial auditions! This is a great shadow to push into your lashes as a liner! It has a little bit of red undertones, and works great on all eye colors! It’s softer than black or an actual pencil and is soft and pretty on camera. Remember, eye liner was designed to make your eyes and lashes look bigger! Love this soft wax based pencil. It gives definition with a soft, natural fullness. One of my all time favorites! It’s super black , gives great volume and pretty, fluffy lashes. Great creamy formula! While I don’t completely do a full beat-down, I do add a bit of sculpt to my face. I have such a round face, so adding a cool sculpting shade into the hollow, SLIGHTLY, gives the face shape on camera. I love this raspberry/red flushed blush on the apples of my cheeks. I always use a large brush to apply it so it’s softer and more buffed in. HANDS DOWN MY FAVORITE LIPSTICK! I love the sheerness of it, and it looks like my lips have just been bitten. It has a subtle sheen, so it’s hydrating but not glossy or sticky. It’s my perfect natural lip. I hope this helps give you a little guidance for getting ready for auditions! Remember. They are hiring YOU so be your best self. I will go further into different looks for different types of auditions/meetings down the line, but I just had so many people ask me what I use. Remember. It’s SIMPLE.